City Terrorized By Packs Of Wild-Roaming Chihuahuas! “Frank Garcia has also seen the packs, “Well the last time I seen six or seven Chihuahuas… and big dogs running with the Chihuahua’s in a pack running every single day,” he said. 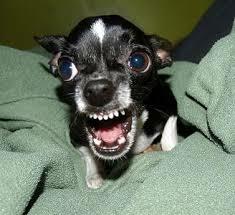 Chihuahua is of course a dog breed native to Mexico. In many other parts of the world these dogs are highly prized. Would finding loving homes overseas be a solution for Maryvale’s roaming chihuahua problem? One can only hope.